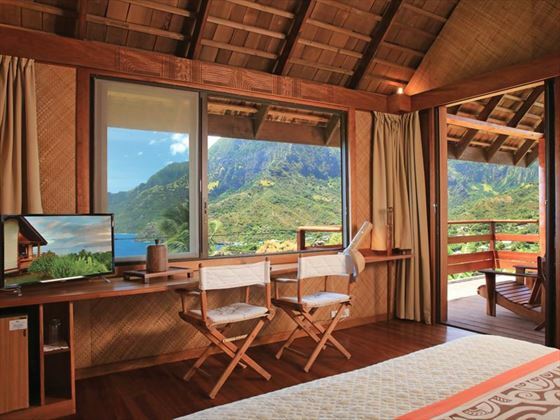 Perched on a ridge overlooking the eastern side of Tahauku Harbour, Hanakee Pearl Lodge features incredible panoramic views of the island’s luscious, wild beauty. On a clear day, you can see Mount Temetiu, the Bordelais Canal, the small island of Hanakee, the distant volcanic island of Tahuata and the quaint village of Atuona. The entire property features intricate hand-made carvings and there’s a majestic Tiki Statue found in the main lobby, serving as a reminder to the cultural significance of this region. 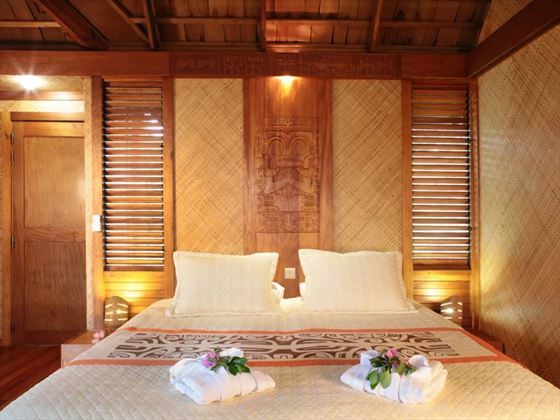 Each of the fourteen bungalows are decorated with creative Polynesian accents from talented local artisans, and all accommodation features stunning mountain or ocean views from a spacious terrace, in addition to thirty-nine square metres of well-appointed living space and plush furnishings, including a king-size bed. 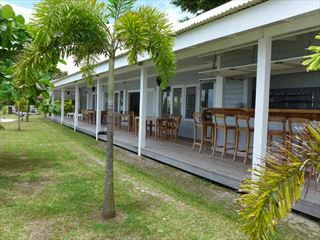 The hotel has one on-site restaurant which boasts sublime island vistas and a wonderfully serene, laid-back environment. 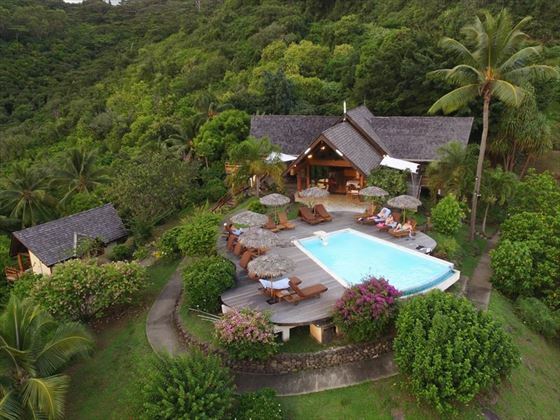 Here, you can enjoy a delectable breakfast or lunch, in addition to a romantic candlelit meal featuring a menu of delightful French cuisine cooked to perfection with a blend of authentic Marquesan flavours. The Tiki Bar is also a wonderful spot to sip on your favourite cocktails by the pool with stunning sunsets and vibrant dance shows. The warm and friendly concierge truly make a stay here superb, and they’ll do their very best to ensure your needs are well-catered for, while the impressive list of amenities ensure a well-rested and entertaining holiday, from an infinity-edge pool, complimentary Wi-Fi and a plethora of cultural excursions to hiking and biking tours, fabulous water sports, diving experiences and outrigger canoeing. 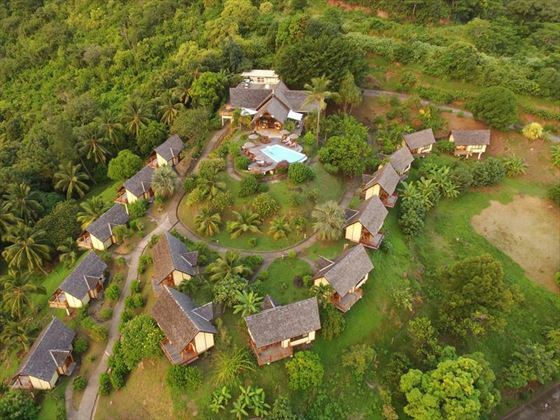 Set on Hiva Oa Island in the Marquesas archipelago, also known as ‘the land of men’, the hotel is located around 1500 kilometres north-east of Tahiti. This is the largest island of the southern Marquesas group, and it retains its breath-taking natural beauty effortlessly. There are lots of little sun-kissed beach coves, ancient statues and magnificent sights to encounter around the islands, and you have so many options in how to explore, from horseback rides and guided hiking tours to picturesque boat trips or canoe boat journeys along the shimmering azure sea. The flight from Tahita to Hiva Oa Island takes around three hours. Nestled amongst the luxuriant tropical gardens, these 39sqm bungalows are simple, spacious and convenient, appointed with decorative bamboo, beautiful patterns and wood panels embellished with local craftsmen’s carvings for a charming island feel; the views over the surrounding valley of Tehueto are utterly wonderful. Accommodates up to three adults with one king-size bed or two single beds (+ one rollaway bed). 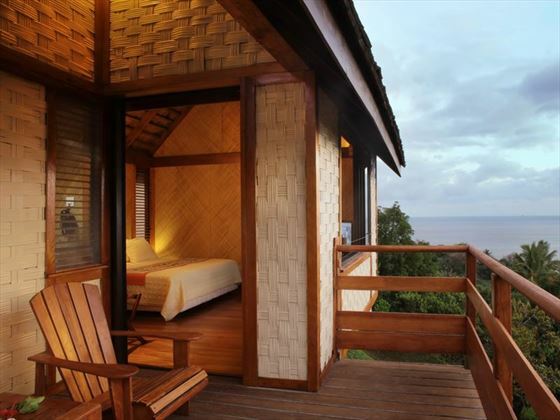 Spanning over 39sqm of well-appointed, serene living space, these bungalows feature a similar layout, amenity list and furnishings to the previous category, however the upgraded views of azure ocean waves from a private furnished deck make for an incredibly breath-taking and picturesque stay. Accommodates up to three adults with one king-size bed or two single beds (+ one rollaway bed). Featuring a similar layout and design as the previous bungalow options, these decorative and beautifully-appointed abodes offer a wonderful supply of seclusion and tranquillity with unforgettable vistas of the glistening ocean and stunning Bordelais Channel from a private, serene deck appointed with plush loungers. 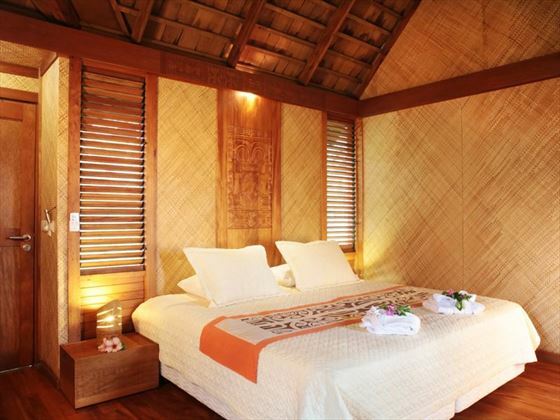 Accommodates up to three adults with one king-size bed or two single beds (+ one rollaway bed). Boasting sublime panoramic views of the surrounding island scenery, Hanakee enjoys a serene, open-air ambience with a laid-back, relaxed feel in the day and a romantic, more intimate ambience at nightfall with candlelit dinners under the stars. 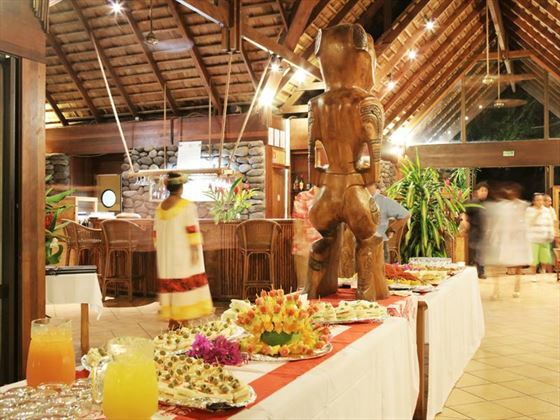 The menu features spectacular French specialities cooked with a blend of authentic Marquesan flavours and served with a fantastic drinks list. 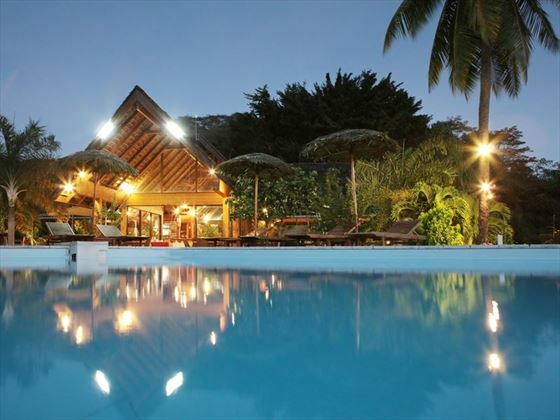 Set beside the picturesque pool, this charming venue serves a selection of mouth-watering tropical cocktails and light bites cooked within the main lodge. There’s a cosy outdoor terrace with majestic views of Mount Temetiu and Traitors Bay, a particularly beautiful sight at sunset. Delight in refreshing drinks by the pool, bask in a cool mountain breeze in the open-air terrace and enjoy vibrant dancing and singing shows all throughout the week. 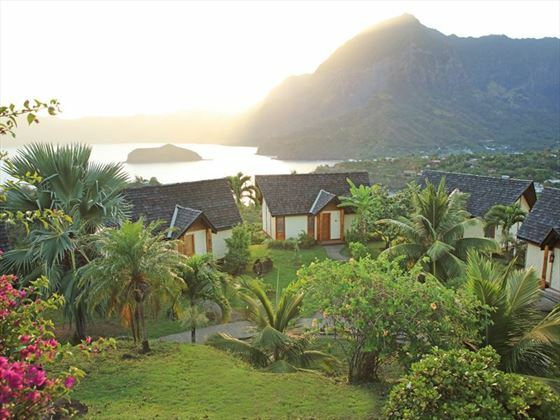 A little pocket of paradise nestled on the West Coast of Moorea Island, Moorea Beach Lodge is nestled along a silky ribbon of white sand lined by emerald palms and a shimmering turquoise lagoon. 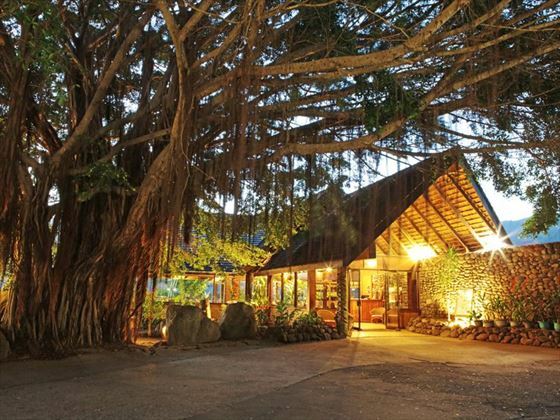 Acres of stunning luscious foliage and tropical flora surround the lodge, creating a wonderfully serene and peaceful atmosphere. An utterly stunning, eco-friendly private island resort located on the serene atoll of Tetiaroa, a unique destination and a viable alternative to Bora Bora. 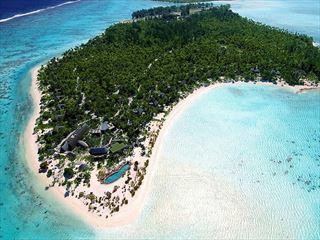 The Brando is a favourite of ours and we know you will fall in love with it too. 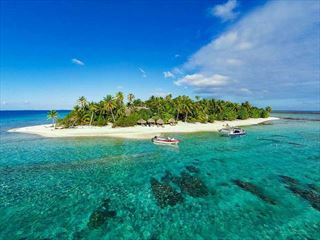 Set on a remote, private island in the Tekehau Atoll, Ninamu is a nature lover’s paradise with a secluded castaway feel. 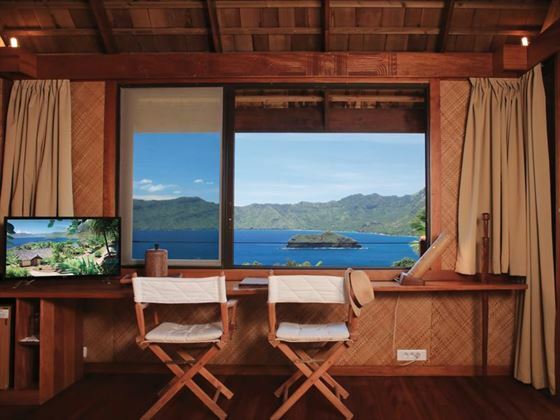 For those seeking adventure and relaxation in equal measure, this virtually untouched retreat will fulfil your wildest fantasies of escaping to a blissful island retreat with little interference from the modern world.